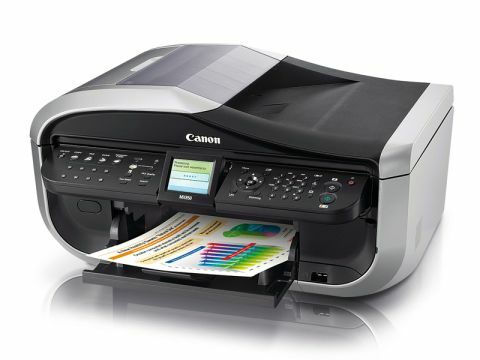 We're used to laser printers that are big and bulky, but the size of the inkjet Canon PIXMA MX850 took us by surprise as it is both wide and deep. You have to remove a huge quantity of packing tape to get to the power cord, ink cartridges and the print head, which are packed inside the printer. It's a five-cartridge design with four slender CMYK dye cartridges that cost £10 each and a bigger black cartridge full of pigment ink that is £12. Add in a £15 print head and the price of consumables looks somewhat on the steep side. Setting up the Canon takes quite some time, as the auto-adjust print head alignment chugs along for 13 minutes, but you have no part to play in the process and can leave it to get on with the job. Installing the software takes about 15 minutes, as there is so much that it is supplied on two CDs. In addition to 150MB of drivers, there is 220MB of Easy-PhotoPrint EX and the MP Navigator EX scanning software weighs in at 65MB. We ran into a quirk of the printer as we loaded the rear tray of the Canon with paper and printed the alignment sheets and then found that the printer refused to print again. After investigation it became clear there is a discreet paper drawer below the output tray and the drivers switch the default paper source from the rear tray to the front drawer. It means you can load one source with A4 copy paper and one with photo paper. There's no pop-up dialogue on your laptop screen during printing, but instead the LCD shows 'printing from PC' and the ink levels are displayed. Print speed is incredibly fast for an inkjet and text print quality is impressive too. There's the added bonus that the Canon can print in colour and mixed content PDF pages look superb. The weakest part of the performance is photo printing, but this is really a minor criticism of a superb printer.